Cast your mind back to 2007. The iPhone had just been released, your mom wasn’t on Facebook yet and Twitter still hadn’t reached its first birthday. Now think about how much all that has changed. You could say the same for the 2017 GMC Acadia. Getting its first redesign since 2007, the three-row Acadia SUV, with room for six or seven, sports improvements across the board. It’s lighter, it handles better and it has more safety equipment. It’s also smaller, has less room inside and costs a bit more than the competition. The Acadia comes in six trim lines, and as is usually the case, the folks at GMC sent me the top-of-the-line Denali. 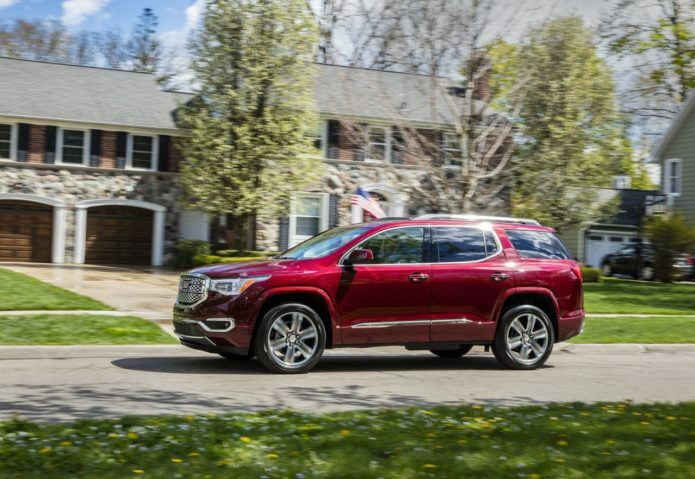 This luxury-oriented trim line, available on all GMC models, distinguishes itself with flashy touches of chrome on the outside and bits of leather and wood on the inside. Special grille full of chrome? Check. Bright aluminum 20-inch wheels? Check, again. Dual chrome exhaust tips? You don’t even need to ask, amigo.